Home renovations can infuse serious value and enjoyment into any property. Modern homeowners are inundated with remodeling styles, materials, and equipment, with each offering its own version of beauty to make you proud of your abode. Kitchen renovations, for example, rely on thousands of style choices to create a complete outcome. Homeowners across the nation are taking on the challenge of improving their property, but many are faced with a bevy of design options. 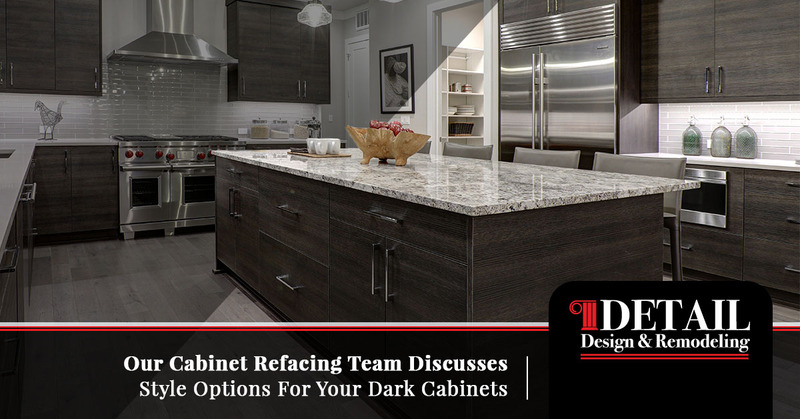 If you have recently decided on dark cabinets for your kitchen, for example, it will fall on you to find the perfect countertops, islands, flooring, and accessories to match and enhance your new design. 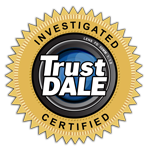 Detail Design & Remodeling is here to provide complete solutions to match our cabinet refacing services in Atlanta and the surrounding areas, providing Old World craftsmanship and long-lasting beauty for every client we assist. For years, our cabinet refinishing experts have delivered complete home remodeling solutions, and we would be happy to help you accessorize your new kitchen style. When it comes to matching their cabinets with the countertops, many homeowners find that they have a range of choices for how best to match their unique style. Today, we’ll discuss three designs you may like for dark cabinets. If you’re ready to create affordable updates for your home, be sure to call us today! In most Georgia homes, it proves a smart choice to go with a lighter shade with dark cabinetry. Our clients often decide on traditional or contemporary designs for their space, and deploy strategies such as contrasting to achieve the biggest impact. When it comes to the countertops enveloping a majority of your wall space, it is essential to find the right materials to match your beautifully refaced cabinets. Dark cabinets, while beautiful, can absorb a lot of the natural light filtering into your kitchen. Homes with dark colors and unlit rooms can feel much smaller, sometimes almost confining in nature. We recommend looking for a lovely countertop that is lighter in color, such as a beige quartz or granite style. Infusing bright surfaces into your kitchen will help to brighten up the space, making it feel more spacious and comfortable in the process. Dark, rich hues can be relied on for decadent outcomes, but balance must be kept in mind at all times. Dark kitchen cabinets can be beautifully balanced by bright white surfaces. Modernists can achieve the perfect look by pairing their black or brown cabinets with pristine white elements, delivering a clean, professional design. In many homes, it will come down to finding the right balance for your kitchen — going too dark will leave your kitchen unlit and uninspired while all-white designs can quickly become too much. This color is widely used in home renovation projects because it is versatile, available in many shades, and can accentuate the look of your dark cabinets with a cool, luxurious feel. Finding the right hue to match your cabinets can go a long way in creating a comprehensively qualitative renovation, so be sure to take the time to look through your color options before making a decision. Remember that gray is great for dark cabinets, but it usually looks better with lighter woods like walnut. Combining a gray countertop and island with darker, richer species such as mahogany may darken your kitchen too much, so be sure to check your combination before getting to work! Homeowners that feel like their kitchen is looking too dark can implement brighter features surrounding your cabinets and countertops to create smaller elements of contrast. Brightly colored backsplashes, lighting fixtures, and countertop accessories can easily lighten up any kitchen. No matter your kitchen design, our home remodeling contractors are here and happy to help create the perfect outcome for you and your family. We specialize in cabinet refacing for Atlanta homes, and can deliver long-lasting and affordable outcomes for every budget. Instead of replace your existing system, kitchen cabinet refacing simply replaces the fronts for a “facelift.” We have the skills and experience to match your design plans, and will come to your property for an in-house consultation. Contact us today to learn more about our complete approach to home design, including custom cabinets, cabinet refacing, and more!